CH Technologies offers the PLG Series, manufactured by Palas GmbH, which is best suited for filtration tests that require higher mass flows. It utilizes a nozzle specially designed to consistently provide particles in the required size range with the majority of these particles in the MPPS range. 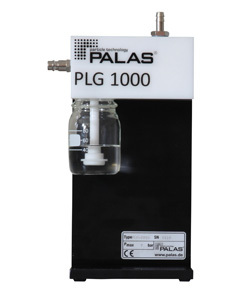 The PLG units are most often used in conjunction with Palas filter media and complete filter test systems. They provide a standard challenge aerosol (DOP or DEHS) to the test area. The PLG Series is used with great success in HEPA and ULPA media testing worldwide.